Jump to a list of all Spanish castle hotels here, or click on a region. Haven't decided on a hotel yet? You can look at other available hotels in Spain with Booking.com. The castle hotels of Spain are among Europe's finest. With their architectural lines beautifully preserved and their cultural traditions respected, they have become part of the landscape of 21st-century Spain. You have a wide variety of spectacular accommodations to choose from: 1000-year-old Moorish hilltop castles, a cardenal's palace, ancient hospitals that once offered comfort to pilgrims on the Camino de Santiago, Renaissance palaces, monasteries, and estates formerly owned by Moorish princes. Sleeping in any of them offers a magical experience, surely one of the highlights of a trip to Spain. What can I expect at a Spanish castle hotel? Is it possible to get married in a Spanish castle hotel? When is the best time to travel to Spain? I don't speak Spanish. How will I communicate? And a little history about Spanish castles? Every region of Spain is filled with magic! Andalucía Bursting with color and alegria (gaity), Andalucía is Spain at its most passionate. Away from its world famous beaches, you'll discover a world of green hills, sparkling white villages, and some of the finest Islamic and Christian monuments in the world. Castilla-La Mancha The legend of Don Quijote tilting at windmills, the medieval splendor of multicultural Toledo, and castles galore highlight this vast and sometimes harsh area. 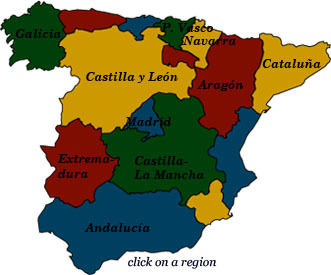 Castilla y León Sweeping plains set to a backdrop of scenic mountain ranges, grand and noble cities, and thousands of castles throughout the region define the heartland of Spain. Cataluña and Aragón A world apart from traditional Spain, Cataluña answers to a different language and culture. Ever stylish Barcelona will captivate the trendy, while the beaches and mountains will satisfy the outdoor enthusiast. Aragón will reward lovers of castles, charming stone villages, and mountain hikers. Extremadura This quiet region is packed with Roman ruins and medieval and Renaissance churches and palaces. It's a quiet region yet as rugged and dramatic as its native conquistadors who conquered the New World. Galicia Medieval Christian pilgrims used to brave terrible dangers to reach the city of Santiago de Compostela. Traditions are alive in Celtic Spain's greenest corner. Madrid Dominated by Spain's energetic capital city filled with world-class museums, palaces, restaurants, and an incredible nightlife, a short drive in any direction leads to delightful towns, inspirational gardens, and mountain resorts. País Vasco and Navarra Deep forests, snow-capped peaks of the Pyrenees, spectacular valleys, and a delightful seaside shore is home to architectural treasures, outstanding cuisine, and the independent spirit of the Basques.